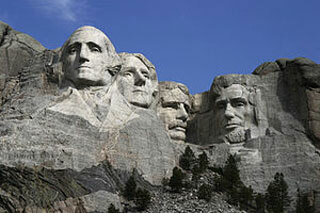 Mount Rushmore National Memorial is a sculpture carved into the granite face of Mount Rushmore. It features 60-foot (18 m) sculptures of the heads of four United States presidents: George Washington (1732-1799), Thomas Jefferson (1743-1826), Theodore Roosevelt (1858-1919), and Abraham Lincoln (1809-1865). The memorial park covers 1,278.45 acres (2.00 sq mi; 5.17 km2) and is 5,725 feet (1,745 m) above sea level. This article uses material from the Wikipedia article "Mt Rushmore", which is released under the Creative Commons Attribution-Share-Alike 3.0 License.